Motorcycles consume less fuel than cars, which means their production of carbon dioxide is also less. As the importance given to fuel efficiency and carbon dioxide emissions increases with time, motorcycles provide a greener option. They also take less space on the road, reducing the congestion and overall automobile emissions. Motorcycles require fewer infrastructures to be manufactured compared to cars. The embodied energy of a motorcycle, just from its much smaller mass, is much lower than a car, all else being equal. In addition, if you consider the contribution of building separate lanes for motorcycles and cars, there’s a huge difference in production of greenhouse gases. If separate lanes are constructed for motorcycles as we have roads for cars, they would emit four times less greenhouse gases to maintain and build. Rare earths are being consumed at a fast pace, and the demand is increasing from different industries, including automotive. The average Prius is carrying around about 10 pounds of lanthanum as part of the battery. A motorcycle uses little to none in manufacturing because battery powered bikes are not widely produced and gas powered bikes are so efficient. Motorcycle manufacturers have realized the role they have to play for attaining a greener environment and are putting catalytic converters in the vehicle, which does a great job at reducing the pollution emitted. They prevent harmful elements from the motorcycle’s exhaust from being released into the air, and converts nitrogen oxide into nitrogen and oxygen before the release.Although these converters does not operate at 100% reduction they are pretty close and factor that into the already low-emission engines of motorcycles and you have a very green ride. The engine of any vehicle is its more prized asset, and as motorcycles have a smaller engine than other vehicles, it uses less energy and fuel. Engine parts on motorcycles are designed to be incredibly efficient because there is no space for wasted parts. From the carburetor to the o-ring a motorcycle engine can be viewed as the pinnacle of individual transportation efficiency. A main reason why people own motorcycles is because they are awesome! 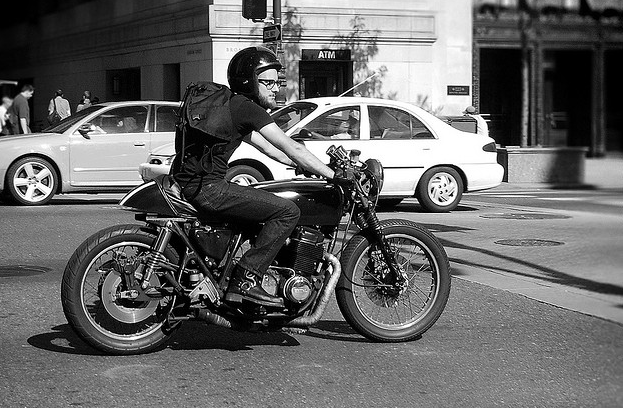 Not only are they incredibly fun, but its hard not to look cool on a motorcycle too! The future of motorcycles could become even more green thanks to solar technology on bikes! Right now you can get a super fun and efficient bike but imagine having a solar powered personal transportation vehicle, the future is bright! Apart from all the environmental benefits of considering a motorcycle, there are other advantages as well. They are more affordable in terms of traveling while spending less on fuel. Even existing car owners can take advantage of a motorcycle, keeping their cars for when they need more space, but using the bike for getting around, which will lead to increased savings and fun.